Down to business. Boaz doesn’t waste any time. He has heard Ruth’s story and he determines to take steps to take care of her. Read Ruth 2:8-9. 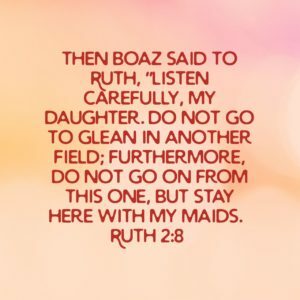 Then Boaz said to Ruth, “Listen carefully, my daughter. Do not go to glean in another field; furthermore, do not go on from this one, but stay here with my maids. He gives her very specific directions. She is supposed to stay there. He has told her that she should not move on and he will ensure that she is taken care of. Still, Ruth had a choice. She didn’t have to stay. She didn’t have to follow his instructions. Yet Boaz was offering that to her. God has offered His protection and provision if we will follow Him. All we have to do is follow Him. We still have a choice and a decision. Will we stay where God has offered to care for us, or will we ignore what God has for us and strike out on our own. God offers us all that we need and we can trust Him and stay where He is.